Did you know Leeks are related to garlic, onion, shallot and scallions? Leeks look a lot like a green onions, although the appearance is similar the difference can be found in the taste. Leeks are very mild and are used in cooked dishes unlike the green onion which can be eaten raw. This dish is wonderful served as a pasta course or first course. It is simple to do because you can make most of it ahead of time. These fresh green beans and baby leeks are easy and quick to put together once everything is ready to go, and the ingredients blend so beautifully together. Recipe from A Treasury of Great Recipes by Mary and Vincent Price. This recipe originally was made at the Four Season’s restaurant in New York. So good! This wonderful Cucumber Soup recipe is from the 1965 cookbook A Treasury of Great Recipes by Mary and Vincent Price. The original recipe came from the Scandia Restaurant in Los Angeles, California. I slightly adapted this recipe is from Stephanie Inn Cookbook, written with Lori McKean and the Stephanie Inn staff. 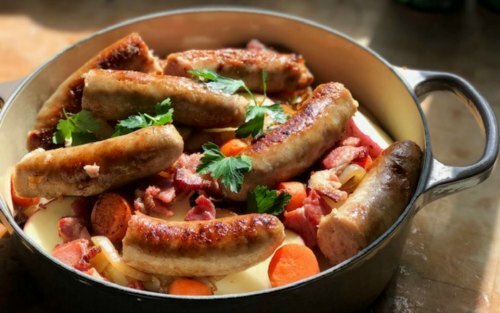 This makes a wonderful casserole for company with its rich, creamy goodness in every bite! The additions of fennel, leek, garlic, and fresh herbs add a delightful depth of flavors to the dish. This is an interesting soup with lots of layers of flavors. I loved the influence of the spicy ginger and adding the heavy cream at the end makes it very special. Colcannon is true Irish soul food. The dish consists of mashing together buttery mashed potatoes with cooked kale or cabbage and leeks for flavoring. For this recipe, I used kale sauteed in bacon and mixed in the bacon crumbles (because I love bacon and bacon gives everything a boost). I love the color of the dark green kale mixed with the mashed potatoes as well as the flavor of bacon and leeks. Irish lamb stew typically cooks in a clear broth instead of a thicker consistency that most Americans are used to. My daughter also used some stout beer to deglaze the meat and onions bits stuck to the bottom of the pan for maximum flavor enhancement. This a delicious and wonderful risotto when the spring asparagus and peas are available. The ingredients list is long, so have everything ready to go (Mise en Place) and then all it takes is about 20 to 25 minutes from stove to table. This risotto goes well with my Lemony Buttermilk Baked Chicken. It also is great with grilled steaks and seafood. Making a good oxtail is all in the cooking, and it does take some cooking. This is not a quick dish by any means, and if it were it would not be nearly as good. So to help introduce you to a meat that is absolutely wonderful when made correctly, I want to share with you my recipe for Oxtails. No one will even realize that they are eating what some may consider “leftovers.” If you have never eaten oxtails, I hope you will take a chance on these. They are most definitely worth trying! And it just isn’t me who says that. This delicious oyster soup recipe and dinner menu were generously shared with my by Linda Sandberg of Newberg, OR. Linda belongs to a Gourmet Dinner Group that delights in making wonderful foods that they share together. Paella is built up from four basic elements: seafood and meat, sofrito, rice, and broth. The proteins can by any combination of shellfish, meats, and sausage. I used a chicken breast, shrimp, and Portuguese chourico (chorizo). The sofrito consists of sauteed onions, garlic, and tomatoes (sometimes with the addition of pepper). For variety and because I needed to use it up, I used a leek along with the garlic and tomatoes. This delicious roast chicken recipe and photos were shared with me by Karen Calanchini, Food Stylist and Photographer, of Redding, CA. The colors are beautiful, taste is excellent, and this Roasted Beet Soup with Creme Fraiche is so easy to make. What more could you want to please your valentine and yourself It is easy to love fresh beets, and not just for their outstanding nutritional advantages. Oven roasting beets seems to enhance their sweet nature. Oven roasting is the easiest way to cook beets. This is a family favorite that I enjoyed when I was young, and still do today. It is a very easy-to-make vegetable salad. Great for taking to a potluck or even a picnic. Your family will love this recipe! This soup is so full of sweetness from the end of summer produce. You have bright colors, fresh taste, and a healthy comfort food. This is a lovely dish, full of fresh flavors, and the comfort of creamy Arborio rice. This risotto is very pretty served along with a fresh salad of fresh butter lettuce, radicchio, and a citrus vinaigrette. This will be one of your favorite soup recipes. So smooth and creamy! I slightly adapted this recipe is from the Stephanie Inn Cookbook written by Lori McKean and the Stephanie Inn staff.